Anti-Isis militants fighting alongside Kurds in Kobani executed a 15-year-old child after he was taken captive with a suspected jihadist, according to a British-based organisation monitoring the crisis. The Syrian Observatory for Human Rights (SOHR) says that 70 Isis fighters have been killed in the past two days, according to sources at a local hospital, as the town experiences some of its fiercest fighting yet. Among those killed, the SOHR said some Syrian Arab fighters from the Revolutionaries of Raqqa Brigade, who are fighting alongside Kurdish fighters, had also executed two Isis captives. "Two have been killed after they were captured two days ago" the organisation's director Rami Abdurrahman told the Independent. "One was 15 years old, he was shot in the head." Mr Abdurrahman said that Isis has been systematically recruiting children as young as 15 by "brainwashing" them and"offering them money." He said his organisation, which documents events in Syria and is not connected to a political group, considers activities such as executing captives on either side as "war crimes." The Independent cannot independently verify the claims. Isis has used executions throughout their campaigns in Syria and Iraq, reportedly killing hundreds of their enemies as well as civilians who are opposed to their cause. Many of these executions have been disseminated on social media. The Revolutionaries of Raqqa, or Liwa Thuwwar Raqqa as they are known in Arabic, are Syrian fighters who have previously fought alongside the Free Syrian Army against Bashar al-Assad. The battle for control of Kobani has raged for months and it continued to rage last night in some of the fiercest fighting yet. Islamic state fired 44 mortars at Kurdish parts of the town of Kobani, some of which fell inside Turkey nearby,Reuters reported. 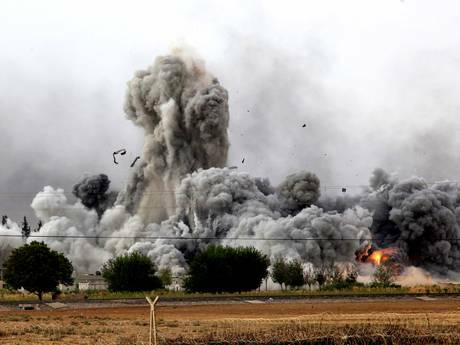 A week ago Kurds warned that Kobani would fall to Isis imminently. As a result, the US-led coalition stepped up air strikes against Isis, which wants to take Kobani to consolidate its power in northern Syria. The SOHR also reported that two car bombs detonated by Isis, also known as the Islamic State, hit Kurdish areas of the town on Saturday night, leading to casualties. "We had the most intense clashes of days, perhaps a week last night. Isis attacked from three different sides including the municipality building side and the market place," Abdulrahman Gok, a journalist in Kobani, told Reuters news agency. "Clashes did not stop until the morning. We have had an early morning walk inside the city and have seen lots of damaged cars on the streets and unexploded mortar shells," he said. Syrian Kurdish refugees after crossing into Turkey from Kobani. Turkey, which has forces along the border overlooking Kobani in Syria, is a reluctant member of the coalition against Isis, and has insisted that allies confront President Assad to end the civil war in Syria which has killed almost 200,000 people since 2011. 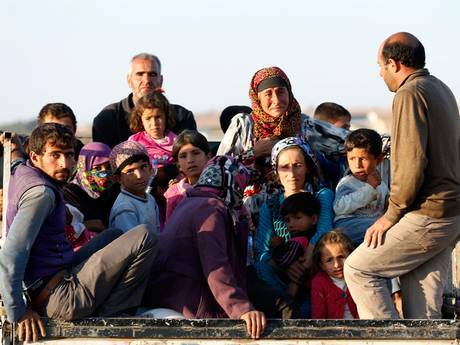 Turkey now hosts around 1.5 million refugees who have fled from Isis, including 200,000 Kurds from Kobani. Turkey has refused to re-arm Kurdish fighters, because it views them with suspicion for having links to the Kurdistan Workers Party. The party has waged a campaign for self-rule in Turkey for the last 30-years. This stance has caused outrage among Kurds in Turkey, who make up 20 per cent of the population, and rioting has occurred in several cities. Turkish President Tayyip Erdogan was quoted from Turkish media by Reuters today as saying: "There has been talk of arming the PYD to establish a front here against the Islamic State. For us, the PYD is the same as the PKK, it's a terrorist organization. It would be very, very wrong to expect us to openly say 'yes' to our NATO ally America giving this kind of support. To expect something like this from us is impossible" he said.